I was restless. Restless and bored. And the heat wasn’t helping at all. The poor old fan in my room had been running all day for days, humming furiously without a moment’s rest. I spent the entire morning reading and had nothing planned for the rest of the day. All I could think about was how I could make the blistering summer days fly by more quickly. Summer had always had that effect on me while growing up back home. The excitement of being away from the rigor of school would wear off so quickly and the long summer days would drag without end. I could think of a million things I would want to do: learn how to swim, take photographs, or travel to places I had never been but those were luxuries my family couldn’t afford. My dad was busy trying to make ends meet and I was certain that a camera or a trip was the last thing on his mind. I never regretted it, though. Okay, maybe I did. I’d be completely dishonest with you if I’d say there were no regrets. But summer wasn’t just all about ennui and regrets. Not at all. When I think of summer I think of my childhood friends and our mundane yet memorable adventures. I think of my radio and my mixed tapes filled with mushy ballads and Cyndi Lauper. And I think of the jars of sweet red mung beans, bananas, jackfruits, and ube jam in our fridge and the ice wrapped in plastic in the freezer. I think of my mom laboriously shaving ice into fine, delicate powder and making halo-halo — a towering stack of sweet fruits and beans mixed together with ice and milk. The delicious hodgepodge of summer treats seemed to make those long, hot summer days go by more swiftly. And wherever I am, even if it’s a hundred degrees or way below zero, rain or shine, a tall glass of halo-halo will always hit the spot and remind me of home. Halo-halo is the quintessential Filipino dessert. It’s a towering stack of sweetened fruits and beans mixed with shaved ice and milk. In a tall glass or a deep bowl, stack the ingredients one on top of the other in whichever order you wish. I usually start with a thick layer of purple yam jam at the bottom and work my way up by layering young coconut, saba bananas, adzuki beans and the rest of the ingredients. Leave some space at the top for the shaved ice. Cover with shaved ice to the rim. 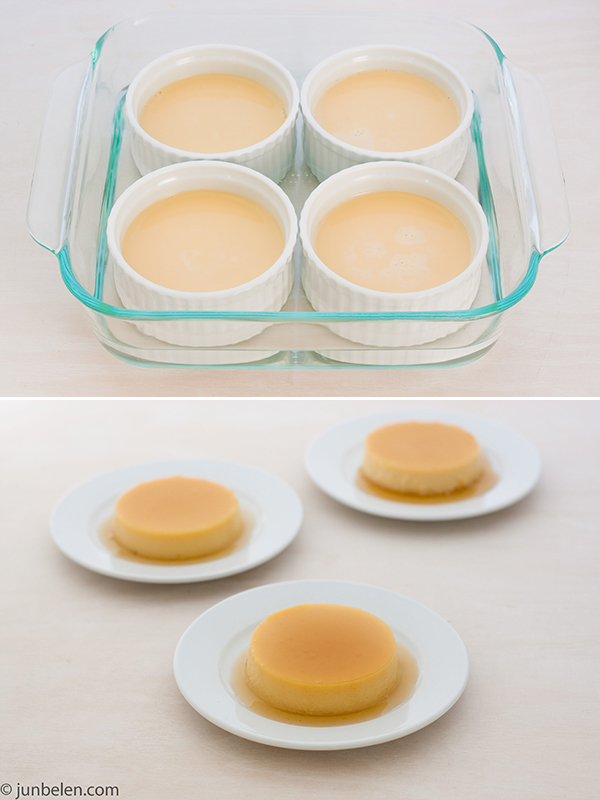 Generously pour in evaporated milk or whole milk and top with a spoonful of leche flan. Mix everything together. Most of the ingredients for a traditional halo-halo are available, ready-cooked and bottled in most Asian supermarkets like purple yam jam, sweetened bananas, jackfruit, young coconut, and beans. The recipes that follow demonstrate how you can make these at home from scratch. 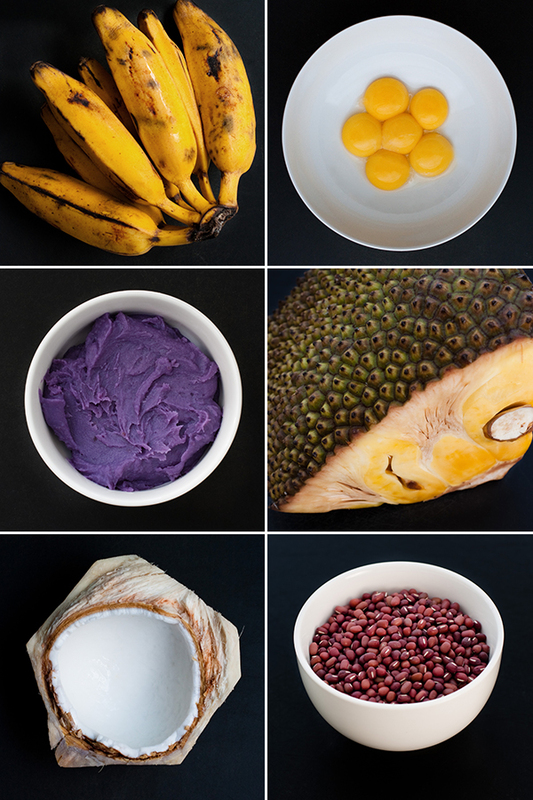 Cook with fresh ube or purple yam whenever possible. Boil purple yam or purple Okinawan sweet potatoes until tender. Let them cool then peel and cut into smaller cubes. Grate in a food processor. When cooking with frozen ube, choose frozen whole over frozen grated yams. 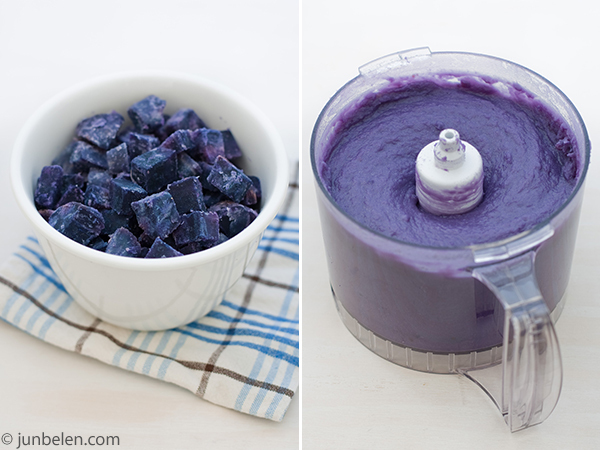 Thaw frozen ube completely, drain, cut into smaller cubes and grate in a food processor. Fresh jackfruits are available in most Asian supermarkets but here in the Bay Area, I get my jackfruit from Berkeley Bowl, which has an impressive selection of produce. Fresh jackfruits are usually sold already cut and wrapped in plastic. Cut off the white spongy top, which is the fruit’s core. This will make it easier to remove the bulbs of fruit. Remove the seeds from the bulbs and cut them lengthwise into 1/2-inch strips. In a small saucepan, combine the jackfruit, water, and brown sugar. Use 1/2 cup of sugar for every pound of jackfruit. Bring to a boil and simmer until the jackfruit is cooked, around 15 minutes. 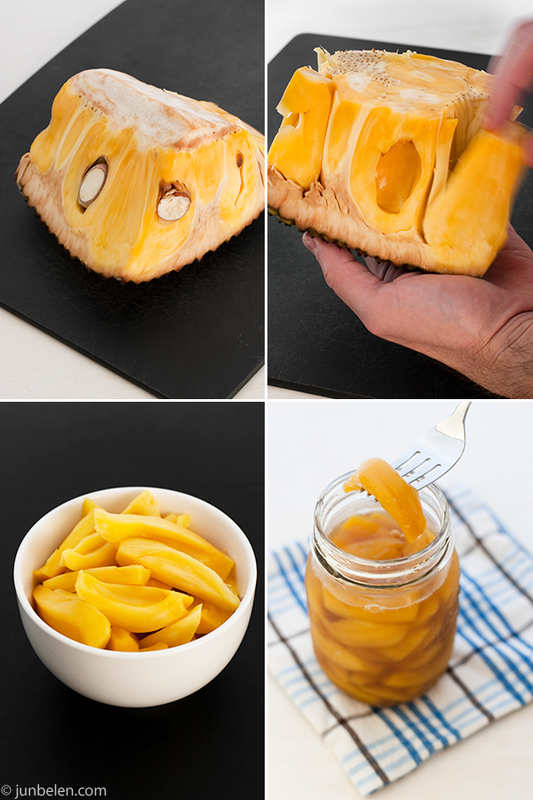 Transfer the jackfruit and the syrup into a jar and refrigerate until ready to use. Peel and cut the saba bananas crosswise into 1/2-inch thick slices. In a small saucepan, combine the bananas, water, and brown sugar. Use 1/2 cup of sugar for every pound of bananas. Bring to a boil and simmer until the bananas are cooked, around 15 minutes. 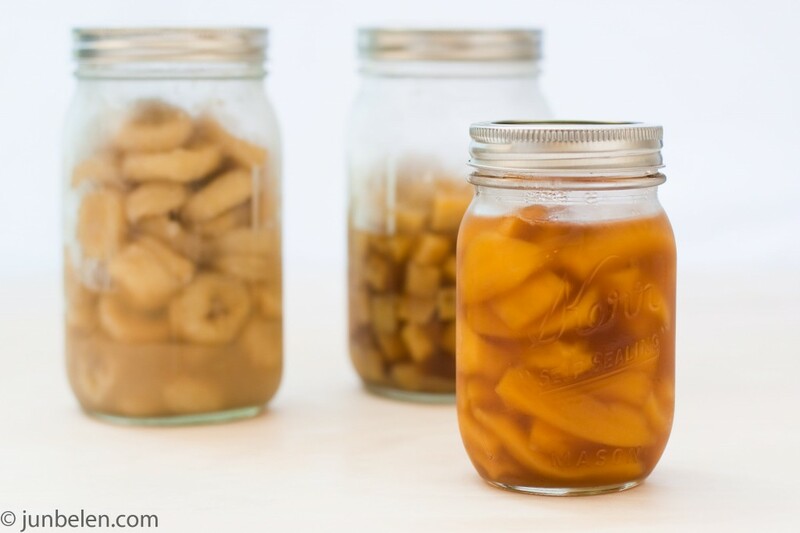 Transfer the bananas and syrup into a jar and refrigerate until ready to use. Similarly, peel and cube the sweet potatoes and boil them in water and brown sugar. Use 1/2 cup of sugar for every pound of sweet potatoes. Transfer the sweet potatoes and syrup into a jar and refrigerate until ready to use. Like fresh jackfruits, fresh young coconuts are also available in most Asian supermarkets. If possible, have someone in the supermarket crack the coconut for you. But if you need to crack it yourself, whack the coconut with the blunt side of a cleaver a few times all around the center until it cracks open into two halves. Catch the coconut juice into a bowl. 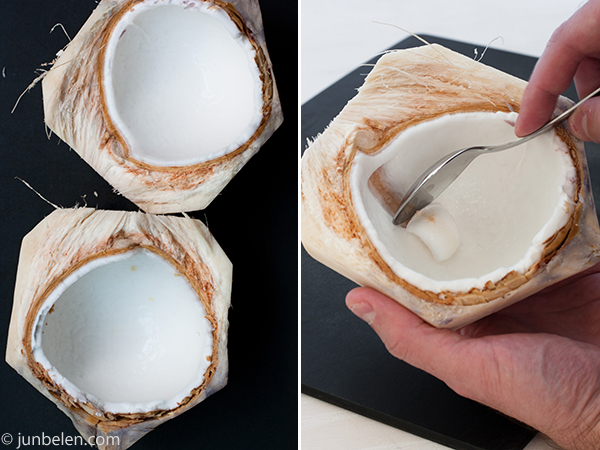 Scoop the coconut meat using a spoon. In a small saucepan, combine the coconut strips, water, and sugar. Use 1/2 cup of sugar for every pound of coconut. Bring to a boil and simmer until the coconut is cooked, around 20 minutes. Transfer the coconut and syrup into a jar and refrigerate until ready to use. Pick over the beans and discard dried and discolored beans. Soak the beans in three cups of water or three times as much water as beans. Leave the beans soaked overnight and drain them the following day. In a heavy saucepan, add the soaked beans, water, and sugar. Use three cups of water for every cup of dry beans. Bring to a boil, reduce the heat and simmer, covered, until tender, about 45 minutes to an hour. Drain and store in glass jars. 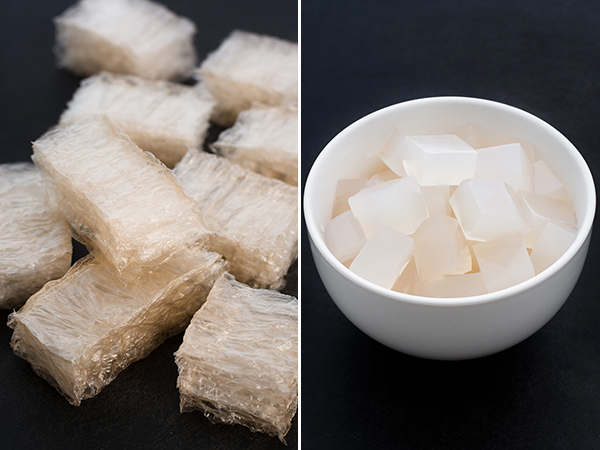 Tear agar-agar into smaller pieces. Add water to a saucepan. Add agar-agar and soak in water for half an hour. Bring water to a boil and simmer until agar-agar is fully dissolved. Add sugar and cook for ten minutes. 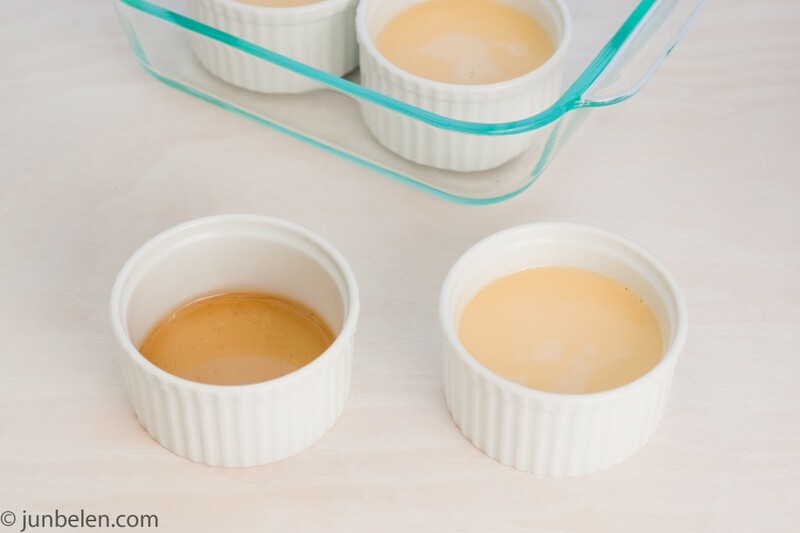 Pour in a flat pan or dish and let it cool until agar-agar sets. Cut into small cubes with a knife. Set aside. Thank you for sharing! 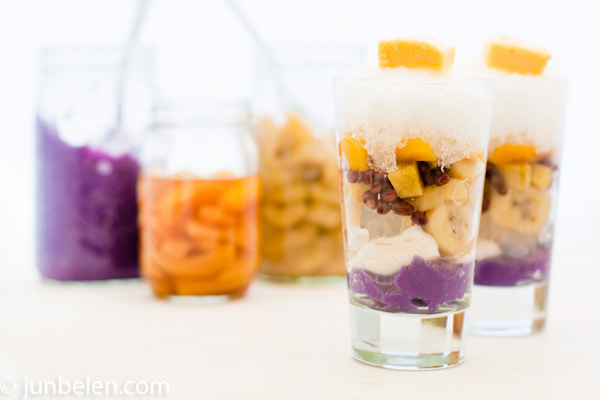 I have never seen a more beautiful presentation of halo halo – EVER! Thanks to Nate Gray, I just discovered your amazing blog, and then he pointed me to this astonishing post. Halo-halo was an obsession of mine when I lived in Naga City for two years. Salamat, po! This helped me a lot, especially the yam recipe. Thanks! 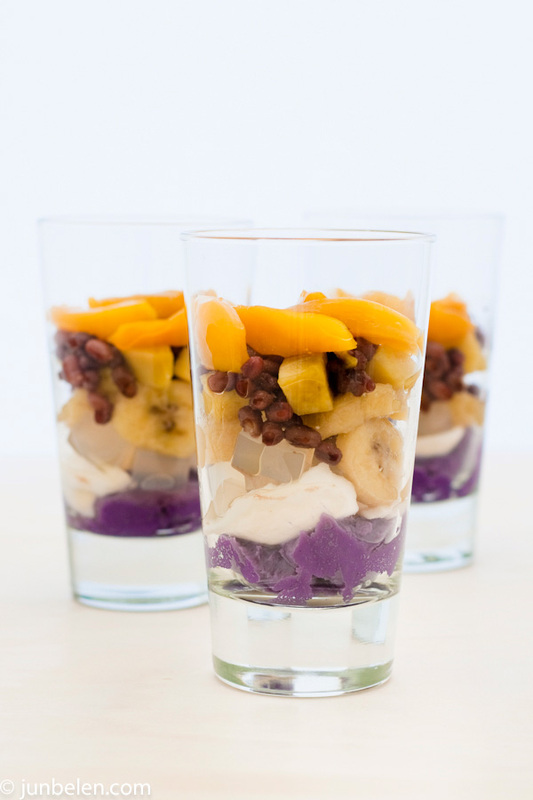 Your halo-halo presentation is great and keep up! Here in Hawaii Halo Halo is a favorite dessert we enjoy year round. Can’t wait to try making it from scratch. You’re very welcome, Kaila. And thank you for writing. Mahalo! I’m a student in the US and I was trying to think of something that would be similar to this recipe. Would it be comparable to a parfait or smoothie? What is the texture like? thank you for the recipe.. this will really help me in my resto business… i’m glad i found this blog. i also got your arroz caldo recipe.. thanks a lot. Thank you, Leah, for writing. Good luck with your restaurant business!